I traveled 10.000 miles to choose this earphones. In my last visit to NY, I decided to buy the best gear under $1.000. So I spent a couple of ours at R&J choosing this superb earphones. I tryedliterally hundreds and the 570 were my decision. They are by far the best, light, clear, crisp, comfortable,excellent dynamics. I am very HAPPY!!!! Comfortable, nice bass and midrange but the treble is too much on the high side. Well built, light. crystal clear sound, natural bass. glittering highs and balanced mids. lightweight. the most comfortable i've ever worn. incredible sound for the money. i recommend these to anyone who loves music in its natural way without any 'coloration'. sometimes the sub distort on the leftside (this failure is not only my flavour), but not always. there are special low frequencies that make the membran to distortion. it's not for travelling, the sorrounding noises come in, it can't be attached to mp3 players or discmans 'cause it's 64 ohm impedance. but i don't believe it's a real mistake. i've been using this headphone for about a year with a nad 302 and with a technics slp390, the interconnects are monitor cables.. i paid only 50$ because it's used, but it's in good repair. i wanted good sound & universal headphones for little money. technics rpf880, tripe philips, akg 301, 501. Incredible sound for little money. None. Cable could have been about a foot longer, but its not a deal breaker. Great set of headphones for the price. Treble was too harsh for about the first week and then they broke in and have been very smooth since then. Just had to give them some time. Not too much bass. Like any new piece of equipment, they made me want to liten to my entire CD collection all over again. They have taken up permanent residence next to my bed along with an old Sony CD player I had lying around. These headphones would probably be good if it wasnt for one thing: the treble. And it isn't just bad, it is absolutely horrible, piercing, disgusting and a MAJOR drawback. If it wasnt for this they would be perfectly fine and probably even good value for money. Everything that isnt classical music becomes unbearable after just few minutes of listening. That's how bad it is. Extreme Comfort Very good sound Not very expencible Good for "Allround" usage (PC, DVD, Stereo, Portables and so on...) Good for many types of music (have tried both classic which they are made for, some Barry White and some other music to) It´s Sennheiser what could go wrong? :) Will never let these phones go I will treat them as a child just so they won´t break because of uncareful handling. I think these headphones are great, I got them for christmas present and can´t be more pleased. This was because my Plantronics .Audio 90´s had broken :/ need new phones and had decided that it was going to be Sennheisers. Many complain about to high highs and bad bass but I think that the phones sound like it says on the front of the package "Natural sound" not to much or to little. One very important thing is that you "burn them in" it will make them sound like they are meant to sound (I thought there was to much bass in the beginning but after they were "burnt in" they sound perfect). I listen to metal (some said that it wouldn´t be a good choice) I think that they work perfectly with the types of metal I listen to (Metallica, Nightwish, Evanescence and more...). I use them in my computer which works fine (some said that they wouldn´t be good for computers) the games "come alive" with these phones it´s a new experience. I do use them to the audio system to which is an little older Pioneer works great with that to. I saw The Lord of The Rings on DVD yesterday and was amazed to hear such things that I hadn´t heard before details in the background that I had never heard before. The soundstage is like everybody says GREAT. When I fire a shot in Counter-Strike I can hear with amazing clarity where the empty shell lands and bounces. The comfort is great, I sit buy the computer and listen to music and play games for long periods of time and I even wear glasses and the phones still aren´t irritating they are smooth (earpads are extremly comfortable) and light, the one side detachable cord is also genius. So If you are looking for new headphones that don´t cost half a fortune these are a very good pick, you get much for your money. Comfortable, sound really good. The bass isn't boomy. Far better than the HD495. I tried the HD495, 570 and 600. Well, the 600 were impressive, but expensive. The HD495 are cheap, but the bass is really too boomy. For the price I suggest you the 570, the sound is good. I use them on a Kenwood Soverein to listenning to movies mostly. Lightweight - Don't feel heavy on head Decent clarity - while bass isn't impressive, headphones reproduce most sounds well. I purchased this set of headphones early in 2002. For the money you pay for this type of headphone, go with a Sony product. My Sennheiser's had the right cup go dead recently (late 2003), which I found was a loose plug, but six months later went dead again, from which I couldn't fix the problem. I functioned on the left cup only for about a month, but it went dead shortly after. I took immaculate care of the headphones, and I am certainly convinced that they are simply badly made. For the money, an equivilent pair manufactured by Sony is much better deal. Not only did I find the sound to be stronger, the design seems more robust, and the clarity and bass seem much much better. At first these headphones did not impress me. The sound was very distant, and small. I could not believe that a company like Sennheiser would release such a product. Much of the frequency range seemed to be missing and the highs were harsh. I just happened to look inside the earpeice and noticed that the driver is located in the upper half of the earcup. Why in the world isn't the driver centered. I ajusted the phones lower on my head so that the driver would be at ear level and this made all the difference in the world. The frequency response smoothed out and they sounded fairly well. Some highs were still a little harsh but overall not bad. Plenty of bass centered around 50-60 hz. 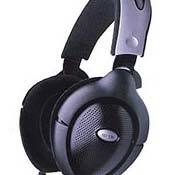 I am using a pair of AKG k240's to compare these to. The sound is still distant when compared with the AKG's and the overall frequency response it not as flat. Highs can still be slightly harsh but not as noticeable on classical or jazz. They will play at moderate levels with a Sony Walkman although most of my listening was done on Denon equipment. I am sure that Sennheiser had some reason for putting the driver in the top but to my ears this was a mistake. I am surpised that no one else has mentioned this fact and I wonder if some of the bad reviews were from those that didn't experiment with the placement of the ear cups. I also noticed that if you press the phones closer to your ear that the sound was much less distant. I will say they are very comfortable and the styling is sleek. Do yourself a favor and listen to the AKG K240 first before you spend this much for a set of cans. If you have enough power to drive the AKG's (they have very high impedance) they are a much better value to my ears. I bought these 'phones because I wanted good quality music. I already own the 265(well my dad does), but they become hot after a while and sound a bit muddy and miss air/opennes. These where the last 570's the store had, the "testers". Downside : I had no box to keep em in (I was on vacation). They were already broken-in but I had only portable source at hand. They sounded good, really good, but when there is some noise around (like in a car/train) they just don't sound as good. Then I came home. I realised that my sony d-e350 wheren't much of a source, my home equipment blew them away: more bass, more high, more detail I read around the web (after buying them) and sadly at a lot of places REALY bashed them though the ground, deep and hard. They don't have "audiophile" bass? up yours! yes they lack a bit, but not a much as "they" say. To much highs? maybe, but not as much as "they" say. They offer a wide transparant clean soundstage, a little more bass won't hurt, but they go deep, and a music-lover (or whatever you want to call it/us) with 99$ to spend really wont be dissapointed, if you have the 80$ extra (that's 180$, almost twice as high) and want a tad extra bass and a tad less high-treble, buy the 580's. senn 265, koss "the plug"